Small Beer Press, 9781931520102, 341pp. Now a motion picture: OtherLife. A New York Times Notable Book, Borders Original Voices selection, and Nebula, Endeavour, and Spectrum Award finalist. Jackal Segura is a Hope: born to responsibility and privilege as a symbol of a fledgling world government. Soon she'll become part of the global administration, sponsored by the huge corporation that houses, feeds, employs, and protects her and everyone she loves. Then, just as she discovers that everything she knows is a lie, she becomes a pariah, a murderer: a person with no community and no future. Grief-stricken and alone, she is put into an experimental program designed to inflict the experience of years of solitary confinement in a few short months: virtual confinement in a sealed cell within her own mind. Afterward, branded and despised, she returns to a world she no longer knows. Struggling to make her way, she has a chance to rediscover her life, her love, and her soul--in a strange place of shattered hopes and new beginnings called Solitaire. 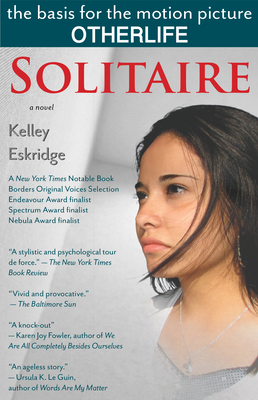 Kelley Eskridge is a novelist, essayist, and screenwriter. Her stories have received the Astraea Award and been adapted for television. A movie based on Solitaire is in development. She lives in Seattle with her partner, novelist Nicola Griffith.